Examine gender inequalities in culture, status, education, birth ratios, health, employment, life expectancy, family size, migration, legal rights, land tenure. Describe the global pattern of gender inequality. Are there any exceptions in the low income and high income countries? Why might these anomalies exist? How could you measure inequality between males and females? Name 4 focus categories and the data you could collect to measure them. Compare and contrast your ideas with the video below. Describe how the gender gap is measured. Name each subindex and describe one variable for each. 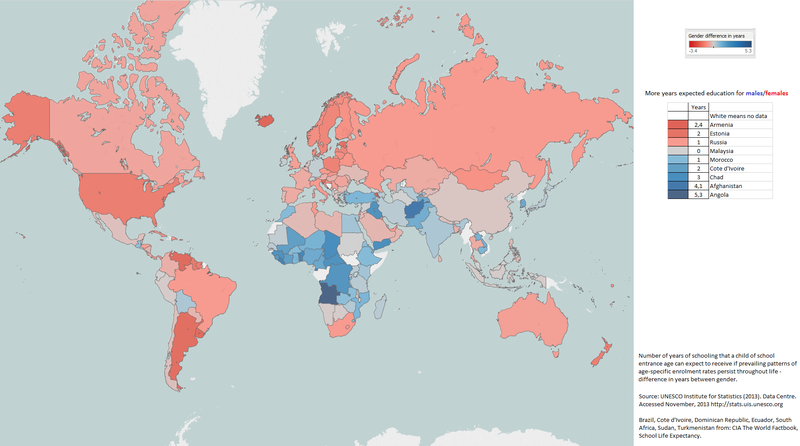 Describe the geographic location of the top and bottom 5 countries in the global ranking for gender gap. Progressive education and health policies allow greater opportunity for women. Highest female literacy rates in India. Matriliny system of kinship in Kerala - inheritance passed through daughters, not sons. Oldest son is responsible for sisters and their daughters. Inheritance has allowed women to enjoy raised status within families. Polyandry - women can have multiple husbands. There are many possible approaches to this question and each should be marked on its merits. Many responses are likely to focus on the Millennium Development Goals and positive aspects of greater gender equality on societies and economies. These include the role of women in influencing trends in demography (via age of marriage, number of children), employment (via presence in the workforce), education, health care and politics, among others. It is expected that the discussion will also include some mention of other factors affecting development, such as the resources available, total size of population and economic and political framework. The strongest responses may challenge the question, either by concluding that they disagree with it, or exploring the meaning of “development”. Responses that do not offer some form of discussion/evaluation are unlikely to go beyond band D. Discussion could involve either looking at multiple ways in which gender equality meets these goals, or looking at other ways of combating poverty, for example, trade, aid. Some responses may choose to disagree with the statement and this is equally acceptable if they can provide a relevant evidenced argument. Stronger responses that include some discussion of other factors or discuss the meaning of poverty or development in more depth are likely to access bands E and F.